SOLD 10/2017. Farm, timber, recreational hunting, homestead...this exceptional property offers it all...as 264+/- acres with 69 acres of active cropland...OR as divided Tracts 1, 2, & 3, each parcel with a good mix of hardwood and pine timber, active cropland, and highway frontage. Excellent hunting land....awesome home sites, easy access to major highways less than an hour from the beach, and 10 minutes from downtown Marion or Wal-Mart. Located 1.6 miles past T-Mart on the W side of S Hwy 41A between Marion and Centenary. 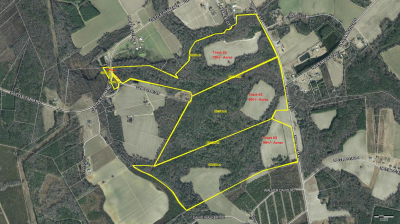 Buy it all...or first come first serve pick of the litter between 78 Acre Tract 1, 90 Acre Tract 2, or 96 acre Tract 3. This is a unique opportunity to own your own prime hunting land; farm active cropland and timber; or build a home or cabin in the country and hunt and enjoy all nature has to offer right out of your own back door. Aerial sketch on this site shows the divided Tracts and combined as a whole. Check it out....and call Robert at 843-230-8460 for more information. This property will sell, its an exceptional property at a great price! See Aerial Sketch-pictures & on-site signage coming soon!